A first time buyer mortgage is no longer difficult to get, but a mortgage with low credit score might take a little more work. However, even bad credit will not prevent a first time buyer getting a mortgage under certain circumstances. Since the subprime mortgage and derivatives meltdown of the latter half of the 2000s, lenders have been very wary of adverse credit mortgage applications. The result is that mortgage lenders are not as ready to offer mortgage loans to first time buyers without satisfactory security (good income, good FICO score, etc). That leaves those with FICO scores at the lower end of the scale wondering what they must do to be able to purchase their first home. This is practically a rite of passage for young Americans, and it might seem unfair to them that the idiocies and profligacy of their youth should count against them when seeking a mortgage. Your income and future income prospects. It is a fact of life that a young doctor or solicitor with a lowish FICO score will have a better chance of being offered a first time buyer mortgage than a non-professional. However, if you can provide proof that your income is more than sufficient to cover the repayments, then the odds are even again. If you have assets, such as own a good car, boat or any other high-ticket item, the lender might take that as collateral, although it is more common for the property itself to be used. If you are given a mortgage and default on your payments, then the mortgage lender can foreclose on your home and sell it to recover the amount you owe. 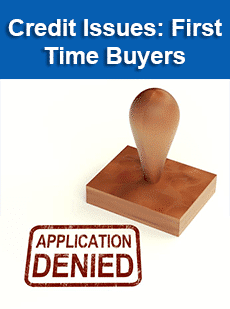 A lender will take each application separately, so while they might refuse one mortgage application they may accept another. It might be due simply to the fact that they believe that you will be able to maintain repayments, but that the other will not. Interest Only/Deferred Interest: If you are offered a mortgage, you will have a number of repayment options available to you. An interest only mortgage is ideal if you expect to be earning more later in your career. With this, you pay only the interest for the first 5 or 10 years of a 30 year mortgage term, and then pay more for the balance of 20-25 years. This option enables those who have just started work to pay less when they are earning less and more as their income rises. Deferred interest loans are similar, although here you can pay even less initially (to an agreed minimum amount) and more when you have more cash available. The unpaid interest for each month is added to the principal owed. HUD Homes: If you have a low FICO score and are unable to find a lender to offer you a mortgage, you might qualify for a HUD home. When homeowners use HUD to insure their homes and then are unable to make the payments on their mortgage, the lender forecloses. HUD pays the lender the balance owed and becomes the new owner. The property is then sold at market value. Because this is a government agency, you can apply for government help to enable you to purchase the property. To do so, you should seek the advice of an independent mortgage advisor. You will also have to use a mortgage broker to make your bid. This is not something you can do yourself. There are other first time buyer mortgage options for those with a low credit score. The above are popular, and much depends on how low your FICO score is. A score of 620 may still qualify you for a regular loan. Try to improve your credit score before you apply, but the best advice is to consult with an experienced mortgage advisor. These professionals are able to direct you to the best solution for your specific circumstances.